Dr. William Quinton of the Wilfrid Laurier University has studied the hydrology of cold regions in Canada, where snowmelt runoff is a big contributor to local hydrology. In one study, Dr. Quinton measured several variables in Yukon Territory, Canada, as a snowdrift containing 10,820 cubic meters of snow melted into runoff. 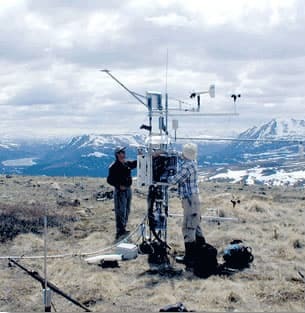 Infrared radiometers mounted on a meteorological tower recorded the soil temperature at the downslope edge of the drift. Read the full journal article. W. L. Quinton, S. K. Carey, N. T. Goeller. Snowmelt runoff from northern alpine tundra hillslopes: major processes and methods of simulation. Hydrology and Earth System Sciences Discussions, European Geosciences Union, 2004, 8 (5), pp.877-890.